The annual Dharmarayana Karaga is scheduled to start on April 3rd, 8 pm and will go on till April 4th, 8 pm. More than 18 pallakis will be coming in from different parts of the city. Here are the traffic diversions in place during the procession. The Karaga is one of the oldest festivals in Karnataka and draws lakhs of people to the Dharmarayaswamy Temple each year. The temple in Thigalarpet is the focal point of the festival. The Vanikula Kshatriya Thigala community worship Adishakti Draupadi as their community deity. The nine-day Karaga festival is observed by them in reverence to the Goddess. They believe that Draupadi Shakti (power) brims over during the Karaga festival. The Karaga carrier is dressed as a female and is symbolic of Draupadi. Is this a Bangalore road or construction site? I ask these private property owners: who gave you permission to block the road? The idea was proposed by a citizens’ community and became a reality through BMTC. 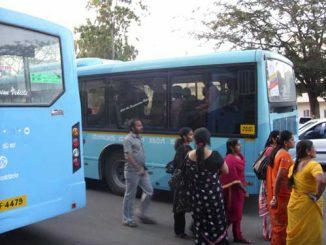 An additional 10,000 Bangaloreans hopped on and off buses on ‘Bus Day’, according to one estimate. Harassed by auto drivers who demand extra fare or refuse hire? Read on to know your rights and find out how you can register a complaint against errant auto drivers.